Westmeath produced a brilliant second-half burst to secure a place in a second successive Leinster SFC final when defeating Kildare, 1-12 to 1-11, at Croke Park last Sunday. That the provincial semi-final clash with the Lilywhites was a surprisingly tepid match did not matter in the slightest to Tom Cribbin’s team, who seized the initiative with a devastating 1-6 without reply. Trailing by six points following a 42nd-minute Eoghan O’Flaherty goal, Westmeath came thundering back as Paul Sharry and Ray Connellan (2 ) landed important points. In the 48th minute James Dolan ventured forward to pinch a crucial score, and further points from John Heslin, Kieran Martin, and impressive substitute Callum McCormack edged Westmeath three clear. 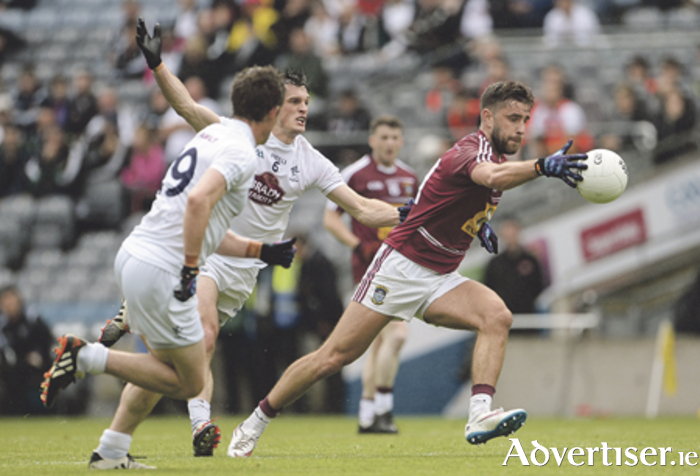 Kildare summoned one late rally but could only muster two points from Neil Flynn, ensuring Westmeath will now face All-Ireland champions Dublin at GAA headquarters on July 17. At the interval, Westmeath were 0-7 to 0-6 behind, but Cribbin admitted that the Midlanders did not get going properly until after Kildare’s goal: “I suppose we probably were a bit too defensive,” he said. “We didn’t attack the game as we should have in the first half. We didn’t do it until they went six points up. But then Jimmy Dolan, Kieran Martin, and Paul Sharry started stepping up and running at them and going at them. And I think that was the difference. Despite suffering a third relegation in a row, Westmeath have enjoyed two encouraging Leinster Championship campaigns. Cribbin, who continues to earn admirers for his honest and wholehearted approach, took responsibility for the relegation: “That was my fault,” he said about the drop to Division Four of the Allianz Football League. “There were certain things we got wrong - 12 players didn’t finish until the end of November and I told them to stay off until after Christmas to get little niggles right. And then we probably brought them back too early in the O’Byrne Cup. Then a lot of these lads carried injuries through the league. Kildare boss Cian O’Neill accepted that the Lilywhites’ failure to score for 28 minutes in the second half was costly: “Yeah, that was probably the most disappointing aspect of the game,” he said. “It was nip and tuck for long periods, a point this way, a point the other, two points up, two points down. When you wrestle that kind of momentum away from an opponent you really need to go for the jugular and be clinical and ruthless. We were neither, in that frantic six to 10 minute period.